COACH (an EU IST project 2002-2004) – developed a component based open source architecture for distributed telecom applications. 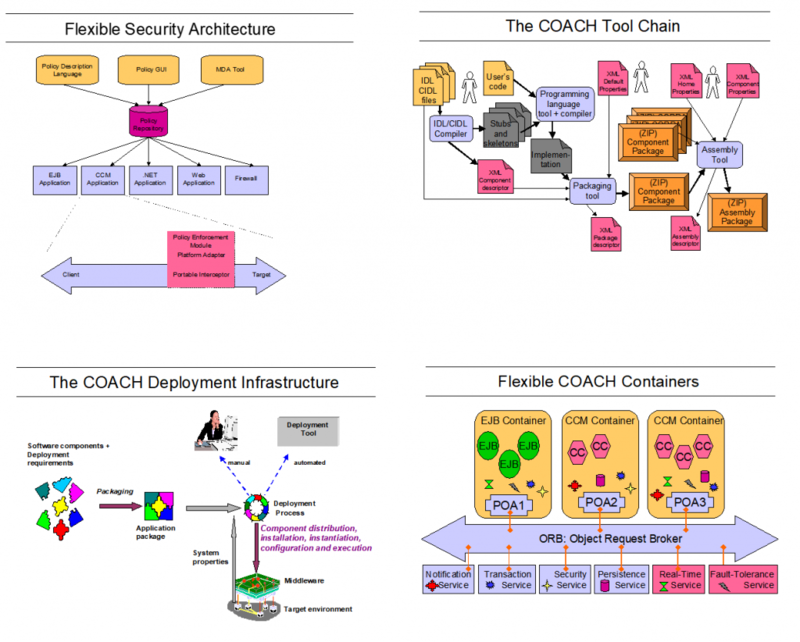 COACH realises a flexible and complete Open Source component framework based on the CORBA Component Model (CCM) standard of the Object Management Group (OMG). COACH allows the rapid transformation of architecture and design level components to execution level ones according to the OMG’s Model-Driven Architecture (MDA) approach. As part of COACH, ObjectSecurity developed the first model-driven security (MDS) Attribute Based Access Control (ABAC) solution in the market. Security: Developed by consortium partner ObjectSecurity, OpenPMF is a new security architecture supports the flexible enforcement of consistent enterprise-wide security policies. Tool Chain: COACH provides a complete CCM tool chain supporting the OMG Interface Definition Language (IDL), the Component Implementation Definition Language (CIDL), packaging and assembling, and XML descriptors. Flexible Containers: COACH develops a new flexible runtime container technology allowing the design, development, and deployment of standard CCM containers, transparently managing system services like activation, communication, notification, security, transaction, and persistency, but also of new application specific containers, e.g. managing logging, real-time, and fault-tolerance services. This allows us to build dependable and adaptable distributed applications suitable for the telecom domain.